Often, active modules (amplifier modules) are used to run individual drivers. These modules won't drive the entire loudspeaker, only one specific driver. Especially for low bass a bass extension or subwoofer is being used. How the whole thing works and how it's going to be connected we'll describe below, using the Subwoofer module Mivoc AM 80 as an example. A subwoofer can be connected to a music system, by extending the leads from the loudspeaker to the amplifier module (high level input wit binding posts). The module combines left and right channel, since both, left and right channel, should be reproduced by the subwoofer. This is not possible for modern digital signal processors like Audaphon DSP-24 or AMP-24, because they don't have a high level input. Should you wish that your loudspeakers are relieved of all lower frequencies, just connect your loudspeakers to the subwoofer module as well. By using a 150 uF capacitor all lower frequencies will be filtered out to make sure that your loudspeakers can concentrate on reproducing upper bass, midrange and high frequencies. 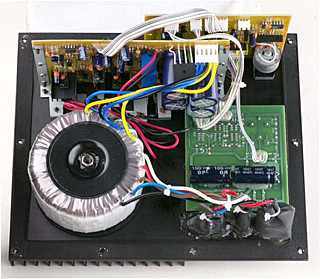 In old subwoofer amplifiers the capacitor is included between high level input and high level output. In state of the art amplifiers you have to insert the capacitor yourself (see red item in the picture). So you could also connect the loudspeaker directly to the main amplifier. Do you have a home cinema system with low level subwoofer output? Even better! Just connect the subwoofer to the low level output by using an RCA plug. Which RCA input you use on the module doesn't matter (left or right channel). Do you possess a better quality amplifier with separated pre and main amp? In this case you should connect your amplifier module directly to the pre-out of your amplifier. Additional feature: should you wish to relieve your loudspeakers of all lower frequencies, you could also connect your main amp to the subwoofer module instead to the pre-amp of your amplifier. This is not possible with Mivoc AM 80 but its possible with Audaphon DSP-24 or AMP-24. Below (1) connections for your amp or pre-amp. - switch the amplifier on or off, or leave it up to the module when it's switched on or off (auto). Below (2) are the four loudspeaker input terminals for connecting the loudspeakers to the module; the terminals to the right (3) are the outputs to your loudspeakers to relieve them of low frequencies (this only works when terminals (2) are connected to your amp). And finally (6) the mains connection. The Detonation module's inside: below left is the toroidal transformer, above the red / black cable to be connected to the driver. To the right the control board with all control knobs. Above the transformer is the main amp board and at the top the pre-amp. All ducts through the heat sink are air sealed to ensure that no air noise develops, should the module be placed in a loudspeaker cabinet without separate compartment. The module comes with remote control (not pictured).